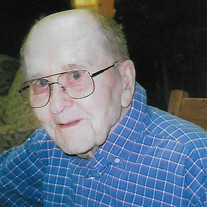 Lloyd Shipley, 100, of Hillsboro, Illinois, formerly of Fillmore, Illinois, passed away Tuesday, January 29, 2019, at Montgomery Nursing & Rehab Center, Taylor Springs, IL. Services will be held at 11:00 AM, Friday, February 1, 2019, at Miller Funeral Home, Fillmore, IL, with Rev. Michael Plummer, officiating. Burial will follow at Noffsinger Cemetery, Mulberry Grove, IL, with Military Rites. Visitation will be held from 10:00 AM to 11:00 AM, Friday, February 1, 2019, prior to the service at the funeral home. Memorials: Fillmore Baptist Church, Fillmore, IL. He was born February 16, 1918, in Fayette County, IL, the son of Henry Russell & Goldie (Stublefield) Shipley. Married Lila Maralee (Mason) Walker August 5, 1939, St. Louis, MO, she passed away January 31, 2013. He was a Mechanic; Farmer; US Navy, World War II, Veteran; Member of Fillmore Baptist Church, Fillmore, IL; and former member of Mulberry Grove American Legion Post 1180, Mulberry Grove, IL. He is survived by: Foster Son - Joe M. Baugh, Bingham, IL; Foster Daughter - Jessie P. Ward & Bob, Vandalia, IL; Daughter -in-Law - Marcia Walker; Half Brother - Melvin Shipley & Ruth, Mulberry Grove, IL; Half-Sisters - Pansey Findley, Lockport, IL and Sue Hagler & John, Pocahontas, IL; Grandson - Robert "Robbie" D. Walker & Lisa, Greenville, IL; Several Grandchildren, Great and Great Great Grandchildren. Preceded in death by: Parents; Wife; Step-Mother; Step-Son - Maurice Walker; Sisters - Myrtle Widger and Elsie Root; Brothers - Claude & Earl Shipley; and Several Half Brothers & Sisters.